The blog has been a little neglected recently, but we hope to have a little more on here in the future. We had our AGM at the beginning of March and Alan Nicholls continues as chair while Mari Fforde is treasurer. The role of secretary has been taken over by Peter Ford, with great thanks to Clare Purcell who has been a driving force in the group since creating it back in 2013. The group is involved in many projects through the work of individuals, including the Wells of Hay, the Lords of the Manor, the buildings of Hay, the model railway, the Castle and of course Hay Tours which is run by History Group members and helps contribute to the funds required for various projects. 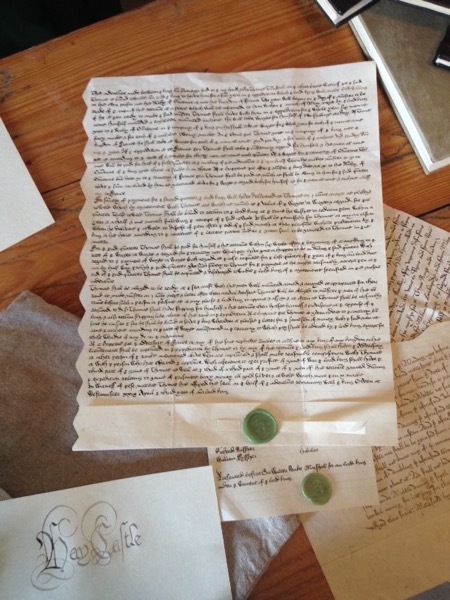 Plans are afoot for the annual History Weekend which will take place bon the weekend of September 23rd and 24th. Watch this space for more information. Hay History Group had the first meeting of the year last week at the Three Tuns in Broad Street. We welcomed back familiar faces with a presentation of recent findings by chair, Alan Nicholls. A diagram of the Masons Arms (now Spar) from 1891, showing the brew house at the rear. Next door was the butchers (now Adyman’s Books) with the slaughterhouse at the rear. A map showing the site of the Cider Mill, orchard and garden, plus Malthouse and lawn tennis grounds, with the railway marked behind, on the area now known as Carlesgate. The building called the Market Hall, was the Butter Market. The pedestrian street running down from Market Street to High Town was called Market Way. Hay Gas Works and Midland Railway map 1902. Castle Orchard, which was part of the George Estate (now George House) in 1902. George Inn, 1872, which was demolished, but had stood on Memorial Square running forwards from what we know as the wall of Chattles, out in front of the Cheese Market. 1833 Conveyance of the Manor of English Hay from the Earl of Oxford (hence Oxford Road) to Joseph Bailey. 1841 Conveyance of Hay Castle from Howe Gwynne and Henry Wellington to Joseph Bailey. So it wasn’t until 1841 that the Castle and the Manor of Hay were reunited. The 1819 Leathermill Lane Indenture shows that Heol-y-Dwr was called Leathermill Lane at that time and the leathermill was located at the Newport Street end. 1950 map showing the possible site of an Isolation Hospital near Gypsy Castle Lane (smallpox). 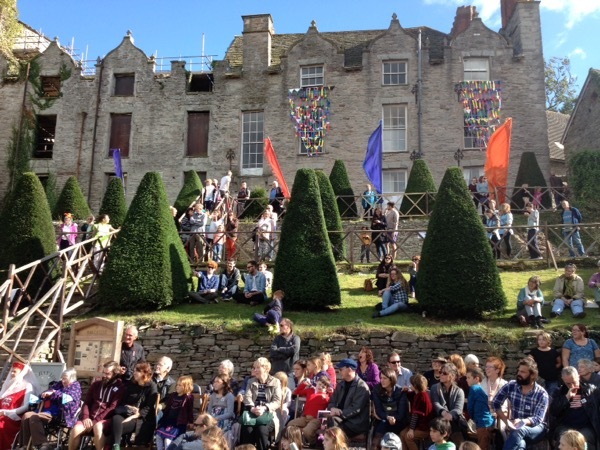 Photos of the performance of Henry V by Hay Theatre Company on Hay Castle terraces and Honesty Bookshop. Big cheers to all involved. 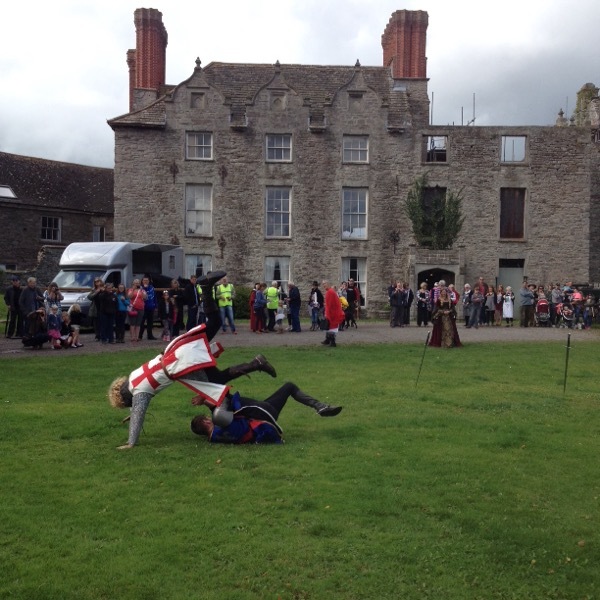 Here are some photos from Saturday morning at Hay Castle. Carriage rides with Cavalry of Heroes, Freemen of Gwent and calligrapher Steve Evans alongside Hay local medievalist Lesley Arrowsmith. School workshops started today with a visit to Lady Hawkins School in Kington. Hay History Group have strong links with the school as Mari Fforde worked with the History teacher there - The inspirational Mr Nic Dinsdale - on the Kington Camp Project. So this year we approached the school to ask if they would like to be involved with a History/Art project involving Agincourt and a Sea of Arrows. Fairfield was great fun last year but we decided that maybe this year we would avoid trying to organise 150 teenagers threading needles and sewing. We needed something a little simpler. So Ingrid raided the local craft shops and armed with a plan, several hundred sheets of multicoloured foam and a bulk buy of mini staplers we headed off for Kington. We learnt the names of the kit that was worn, why knight's armour developed as it did and what the advantages and disadvantages were when compared to the english and Welsh archers. Then was the turn for our second volunteer - a Welsh archer from Brecon. We were very lucky to borrow some amazing kit from Lesley Arrowsmith in Hay including a longbow, arrows, a quiver and some linen garments. Did you know that the feathers on the arrow always have to be made from a left or right wing and never both? If you mix the two the arrow will never fly straight. Once we had pitted the heavy, armour clad, gauntleted knight against the swift archer we de-robed and set to work on creating our vision of a sea of arrows with the pupils. 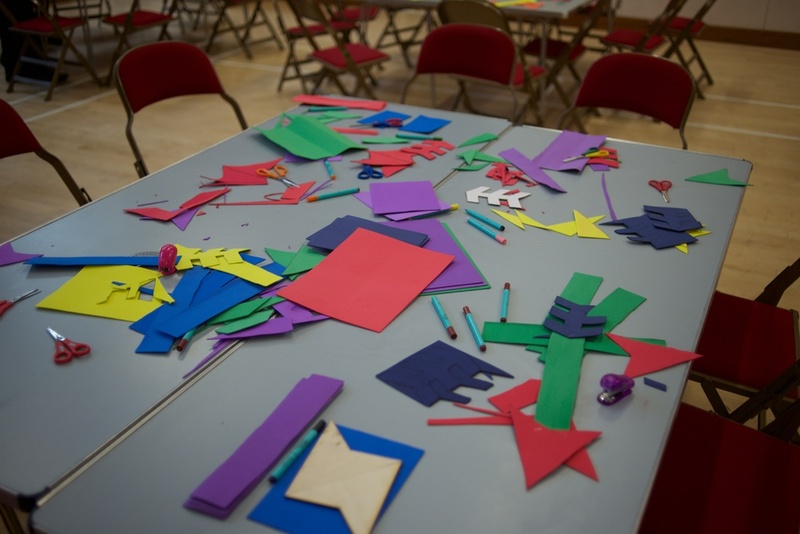 Each group was armed with templates (kindly provided by Ian Berril) fun foam, pens and staplers and they immediately set to work on building their arrows. One snack break and a lot of cutting and stapling later and we had our sea of arrows ready to arrange together. 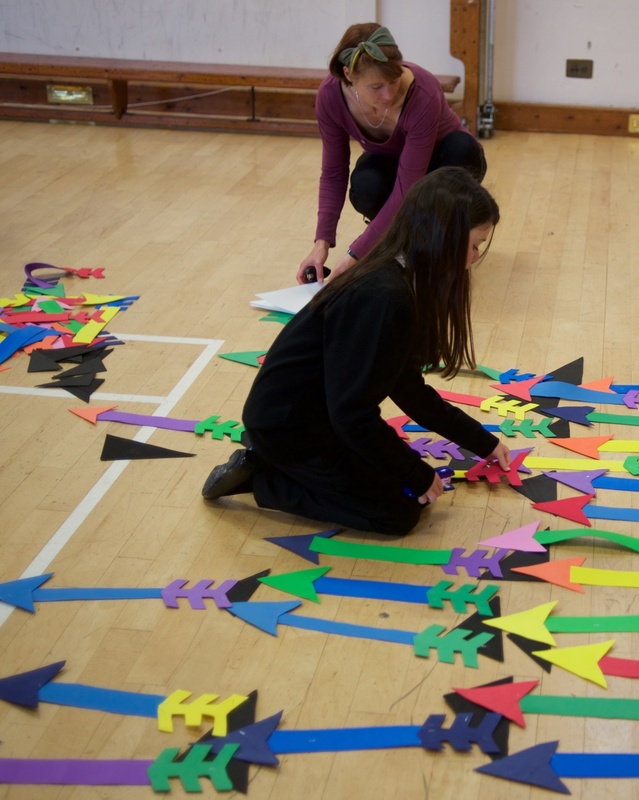 Ingrid chose some willing, staple happy pupils to help her in the construction of the 7 foot high pennant style banners and we soon had two pretty impressive artworks to hang at Hay Castle for the weekend. Huge thanks to year 7 History and Geography for joining in and a big cheer to Mr Dinsdale for letting us come in and have fun at Lady Hawkins and also for keeping history alive and vibrant! Tomorrow we head off to Fairfield School with Super Emma Beynon to write some Agincourt poetry. The plan is to then display some of these poems in Hay Castle over the weekend. 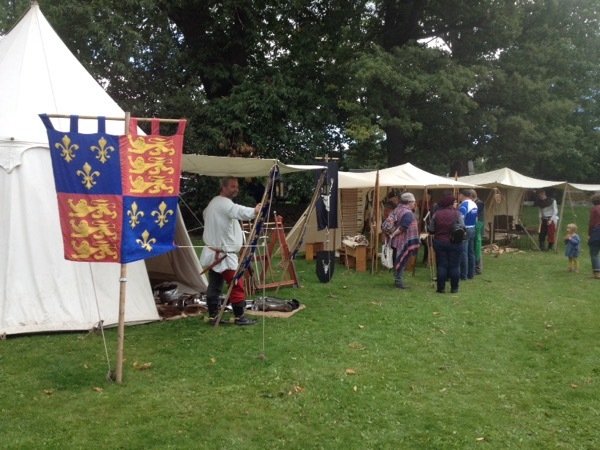 The History Group have been busy recently as we gear up for our Agincourt themed History Weekend in September. 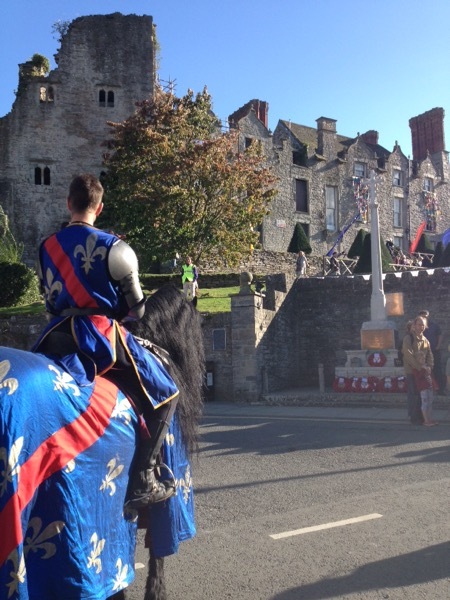 The programme is looking great and we can now confirm that we have Professor Anne Curry coming to talk at Hay Castle about the Battle of Agincourt. Tickets are now available on our website. We have also secured Bob Woosnam-Savage who will be talking about weapons and armour on the Friday night after a screening of Olivier's Henry V at Booth's Cinema. We have also had some interesting emails recently including the following poster from Rob Jones whose family lived at 2 Coopers Hall and worked on the railway at Hay Station and Clifford Crossing. Hay History Group will be running the first annual children's story writing competition on March 26th at Clyro Primary School. Author Jasper Fforde will be running a workshop in Clyro School with year 5 & 6 pupils, looking at short story writing, the craft of story-telling and ways of writing your local landscape and history into your stories. These themes have been chosen to pay tribute to Rob Soldat, in whose memory this competition has been created. Prizes have been provided as a result of a fund in memory of Rob Soldat - with Thanks to Haydn Pugh in the Backfold for organising the prizes. The stories that the pupils produce during the day will then be judged over the Easter holidays and the prizes will be announced in the first week of the term after Easter. Members of the History Group have just been out on an informative guided heritage tour around town - despite the rain. Organised and led by Dave Bennett we were shown some of the important sites around the town as concerns the introduction of the tramway back in the 19th century and the building of the steam railway in 1864. This was also tied in to the other industrial aspects of the town including barges, wharfs, tanneries, mills and coal yards. It was an intriguing and inspiring walk with other members inputting their own knowledge and experience. Mark Robinson has been involved with the Hay model railway project and is currently rebuilding the model that was brought to our attention last year. Along with colleagues he has negotiated the use of the school room next to Salem chapel to base his project. We look forward to hearing more from Mark on the progress of the project when we meet on March 18th for our next general group meeting. Dave Bennett and Alan Nicholls also travelled to the National Library of Wales in Aberystwyth on Wednesday and will be enlightening us on their finds at the next meeting. Alan is continuing his work on the buildings of Hay and the next step - Rural Hay. Hay's history was also featured in the Brecon and Radnor newspaper this week with articles about his recent publications: "Major Injustice - The Case of Herbert Rowse Armstrong" and "The Pubs of Hay"
Conversations at the conference will hopefully lead to some great new relationships and projects for the Hay History Group. Mari Fforde will be talking about the conference at the next meeting in March and also with the History Weekend committee. 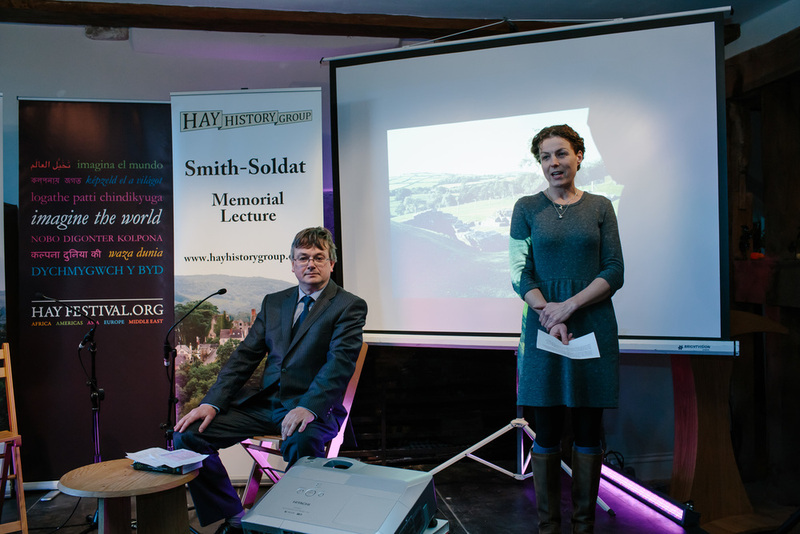 Hay History Group were delighted to be involved in a series of workshops and talks at Fairfield's WW1 day yesterday. 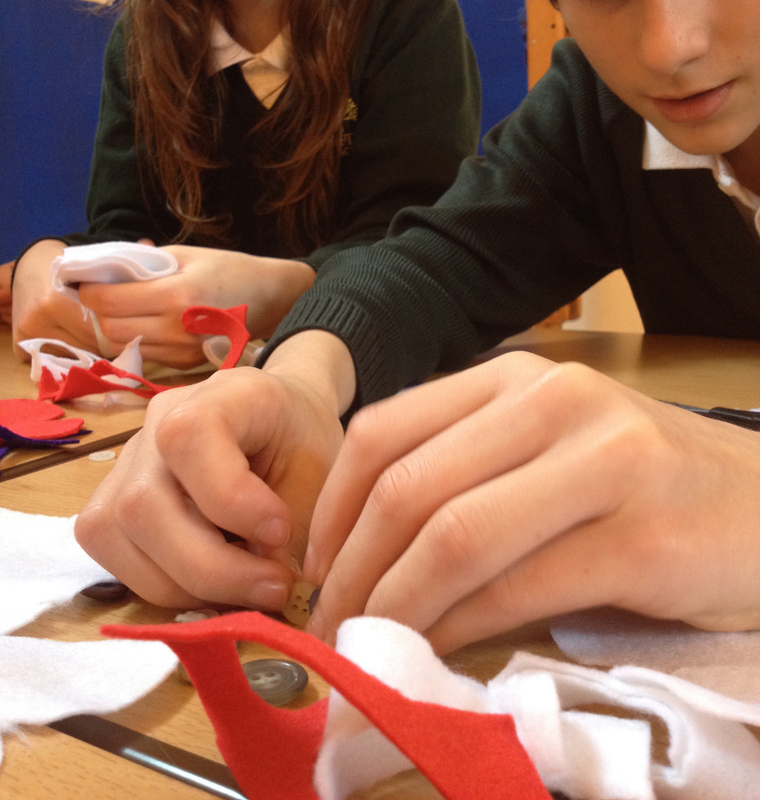 The school's history teacher, Joe Emmett, asked the History Group to run some poppy making workshops after seeing the History Weekend event that was held at The Old Electric Shop in September. 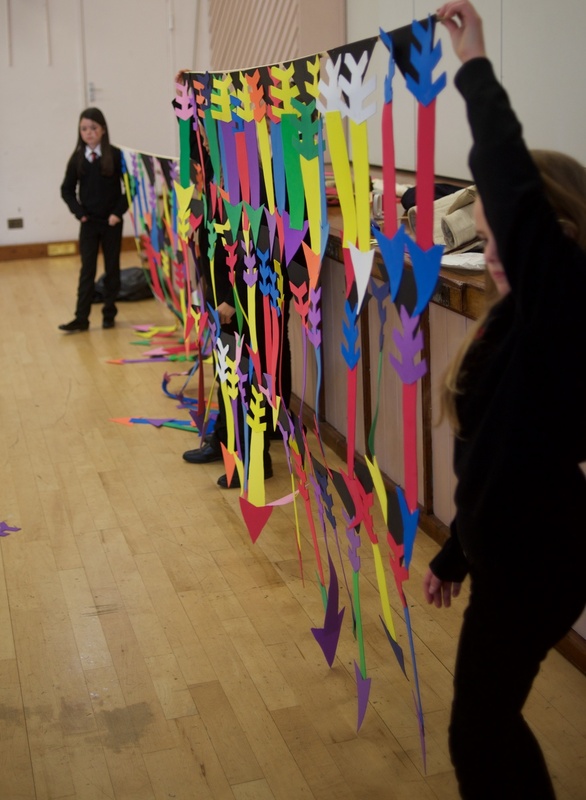 The results of the Weekend workshops might have been seen by some when they were hung next to the war memorial in Hay. 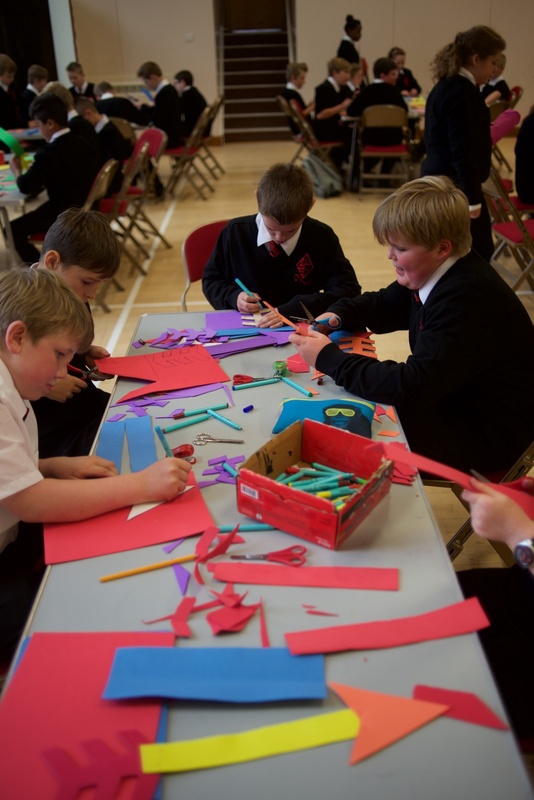 A little scaling up was required as this time there were to be six workshops of around 50 pupils in each throughout the day, meaning that every pupil in years 7, 8 & 9 would be able to be involved in making a poppy as well as a variety of other workshops during the day. These included a memories wall with added barbed wire decoration, debates upon warfare and the proliferation of war themed games for xBox and PS and also a poetry talk by Owen Sheers. 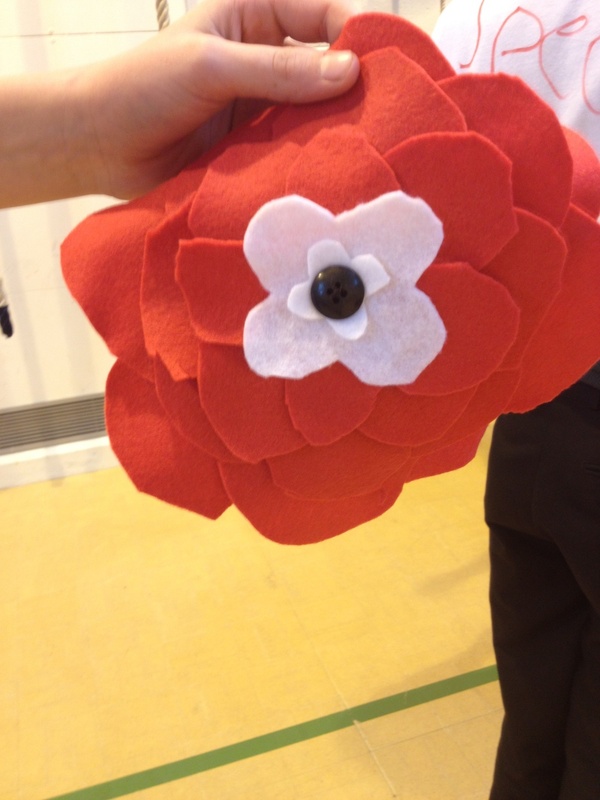 The pupils were really enthusiastic and great to work with, some of them making more than one poppy each and others elaborating on the simple design with embellishments and creative designs. 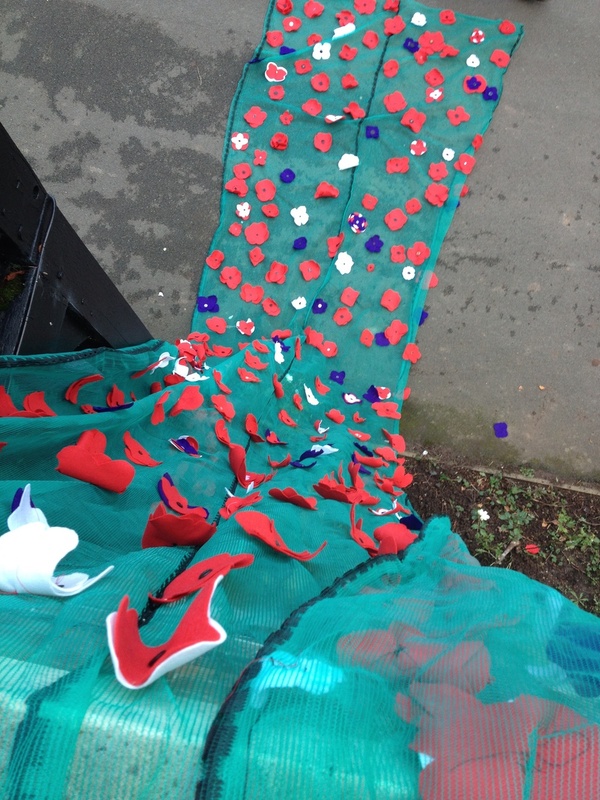 Once made, the poppies were sewn on to a huge length of netting which was hung out of the English room window at the end of the day. 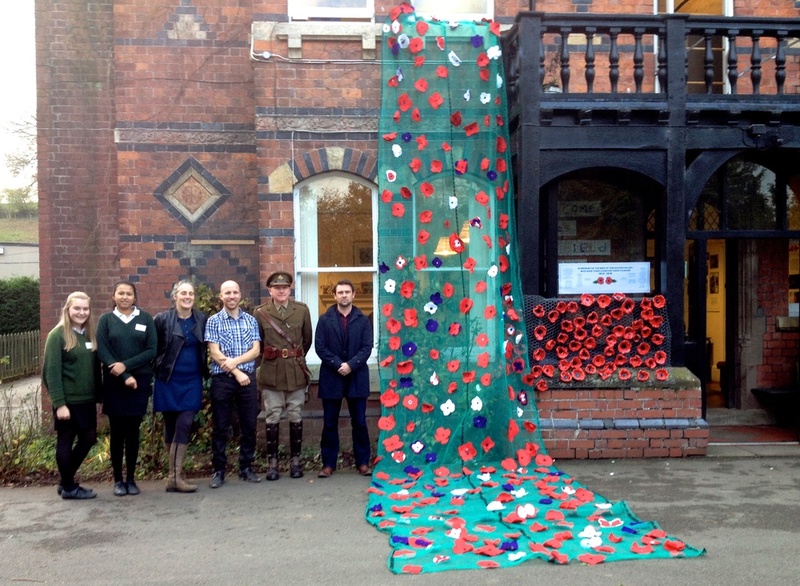 This impressive handmade poppy memorial looked fantastic alongside the ceramic poppies previously produced by the school's Art Dept and proved a great backdrop for a quick photograph of Owen Sheers alongside a WW1 General who happened to turn up for the day! Hay History Group are very proud to have been involved and are looking forward to working with Mr Emmett and his pupils again in the future. Huge thanks also go out to our two incredibly hard working volunteers who came up with the idea back in September and supported the workshops yesterday - without them it wouldn't have happened. Thank you Ingrid and Bex! Some amazing footage has come to light which shows American soldiers at the 107th US Hospital in Kington during the Second World War. The film was shot by Corporal Clarke Morgan who was posted to Kington in 1944 along with hundreds of other Americans who formed the 107th and 122nd Hospitals based in Kington. Clarke Morgan was not only an important member of staff but also a talented musician who recorded at the BBC for the American Armed Forces Broadcasting Network. The black and white film shows soldiers and their day to day activities at the hospital, known as Kington Camp. We see them boarding a bus to Hereford to join what looks like celebrations for VE Day. Scenes show the streets full of people, the old black and white house in the centre of Hereford, All Saints Church and Hereford Cathedral. Quite surprisingly the film then moves to colour and shows the American soldiers packing up and preparing to leave the Hospital for their return to the States. They then board the Queen Mary, cross the Atlantic, spotting airships on the way and then arrive in New York to views of The Statue of Liberty and the Empire State Building. It's a fantastic piece of footage, documenting the experience of an American soldier in the UK between 1944 and 1945. The Imperial War Museum have expressed their interest in preserving this film in their archive and making it public on their website as it has been offered by the daughter of Clarke Morgan. The Hereford Times recently featured an article about Rosa Blanche Williams in "thewalk" section by Garth Lawson. 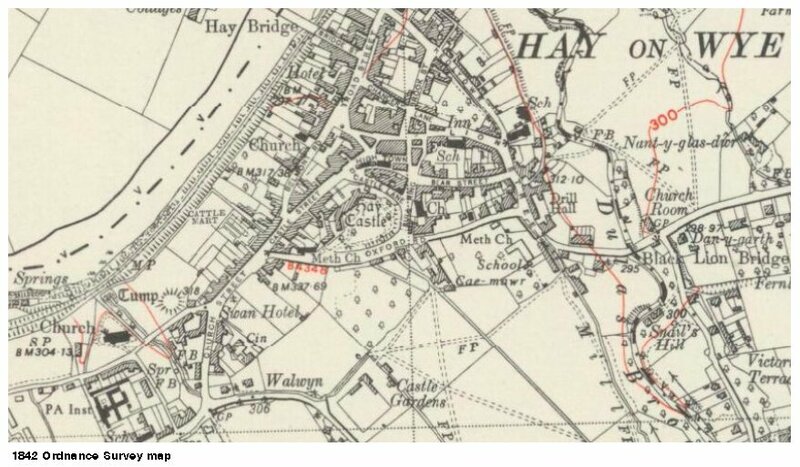 His article tells the story of Rosa and her fateful final journey from Hay to Painscastle on 22nd December 1925 and also gives details of a 5-6 mile walk that you can go on which encorperates Rosa's memorial on Llanbedr Hill. (Editor's note: It has been pointed out to Hay History Group that some of the information provided to Garth Lawson for this article was not correct. We apologise for this. We have since received an email that points out that Marian Lally is not the daughter of Ted Breeze, but the daughter of the youngest of Rosa's children who was Richard Allan Williams. Ted Breeze bought the Pant farm but was no relation to the family at all. 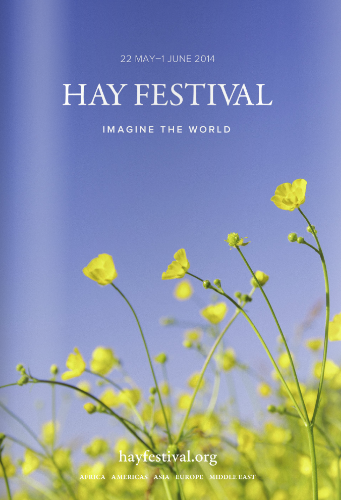 The Hay Festival begins on May 22nd - so not long to go now. 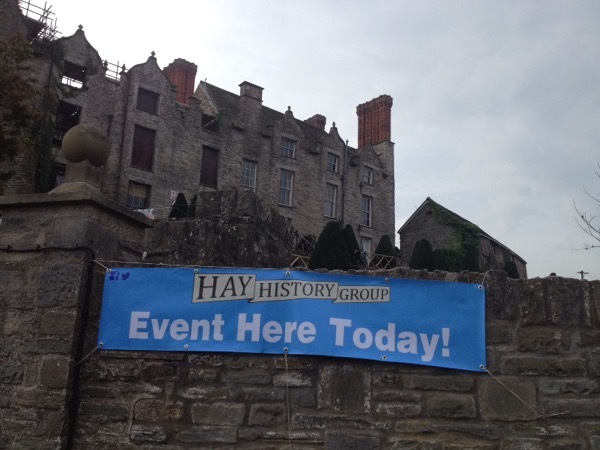 The Hay History Group has been working with the newly formed Hay Tours to offer guided tours around Hay on Wye. As part of the Hay Festival there will be 4 different guided tour routes in and around Hay. Essentially they are about people, places and past events in the history of Hay. They aim to provide a colourful overview to the town and its’ cultural heritage. They are designed to be fairly short, informative and fun. The first walk is called the HAY HERITAGE TRAIL TOWN WALLS ROUTE. This tour takes in all the main historic features of Hay, including the Cheese and Butter Markets, some of the towns’ former public wells and many of its’ pubs (there used to be 40 Inns in Hay back in the good ol’ days). It also covers the three gateways to the original Medieval walled town, Hay Castle, and the place where people would ford the River Wye before the first bridge was built (1763). There is a short stretch of narrow footpath, along the Wye Valley Walk that can get muddy. Meet outside Hay Cheese Market, Memorial Square, in the centre of Hay. Tour will finish here too. Whilst doing a bit of research in preparation for the History Weekend in Sep which will centre around the centenary of WWI I discovered this little potted history of the Forestry Commission. 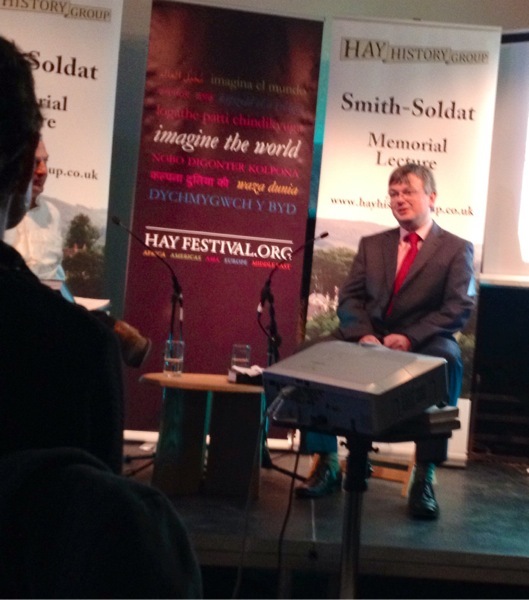 Hay History Group were very proud to attend the inaugural Smith-Soldat Memorial Lecture this weekend at the Hay Festival Winter Weekend. The talk was an interview of Robert Scourfield who recently completed an update to the Pevsner Guide to Powys. Robert was interviewed by Justin Albert, director if the National Trust in Wales. 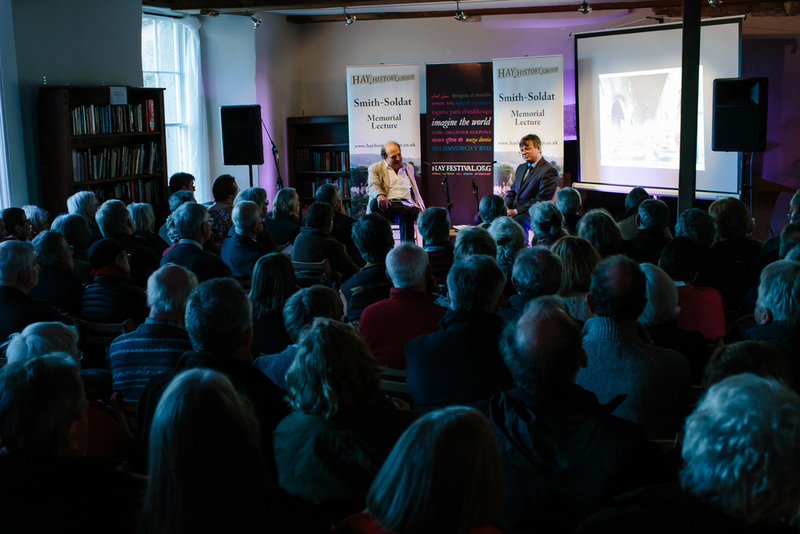 The talk proved so popular that it rapidly sold out and a second talk was held on Sunday, also selling out. Robert Scourfield gave some very interesting insights into the writing of the guide to Powys and discussed some of the highlights and concerns if working with architectural and building heritage. Hay History Group were also able to organise a workshop on Saturday evening whereby Robert gave a guided tour of several streets in Hay. He showed the group methods of identifying the hidden history if some of the buildings that we may pass by unawares everyday on our streets. It was a highly enjoyable workshop, greatly appreciated by all those that attended. We have added some of the photos that we took over the weekend to the gallery on the website. It was great to see so many people over the weekend and to have so many interesting conversations about local history. 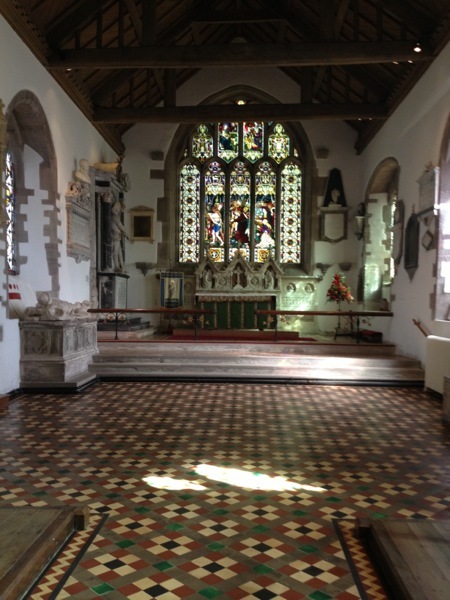 Weobley church of St Peter & St Paul has been open today for the Festival of Churches. 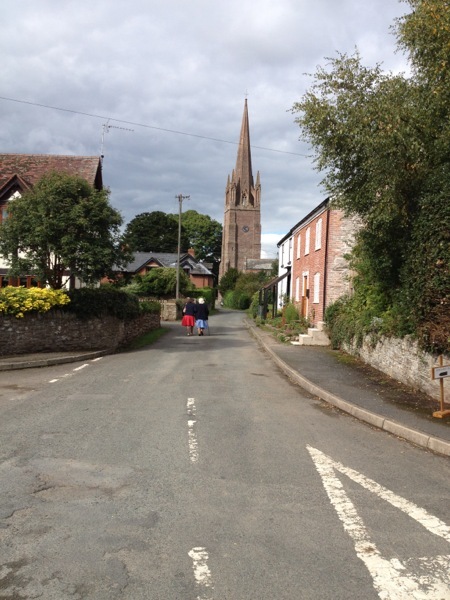 Very interesting tours were taking place as well as an exhibition of old images of Weobley. Plus delicious cakes and cups of tea. Outside the Old Lion pub children could build a one third scale Tudor house. This fantastic activity involved working out carpenters marks, making wattle panels and shaping pegs - as well as plenty of team work. There were also heritage tours being conducted. Another is planned for 3.30 on Sunday. Phone 01544 318322 for details. The Posters will all be up around town - you can see them in the shop windows. These posters explain what the building was previously and when possible, display a historical photograph. If anyone has any more information about the buildings around town, we would love to hear from you. Right now we are getting things ready for the Pop up Museum in St John's Chapel on Sunday and making all the badges which will be prizes for those that complete the Historical Quiz around town. You can pick up the quiz sheets from inside Shepherds Ice Cream shop.